Tyler Cowen discusses the dangers of American complacency. Americans are becoming more complacent. People socialize with similar folks on Facebook and get food delivered through Uber while sitting at home streaming Netflix. Folks medicate themselves more, keep to themselves and move less often. This isn’t the same restless America whose grit helped transform a British colony into a major superpower. 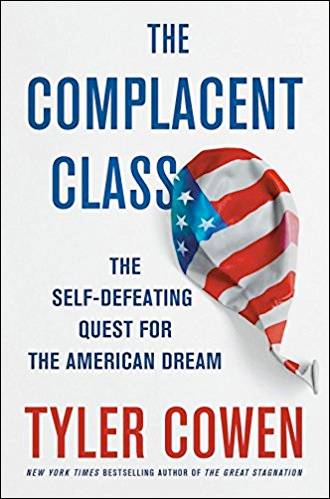 Economist and blogger Tyler Cowen explores this theme in his new book, The Complacent Class: The Self-Defeating Quest for the American Dream. An economics professor at George Mason University, he is also chairman of the university’s Mercatus Center, a free-market think tank. Cowen recently spoke on the Knowledge@Wharton show, which airs on SiriusXM channel 111. Knowledge@Wharton: Explain this need that people have for comfort and security in our society. Tyler Cowen: American dynamism has been declining for several decades. We now have a society where we’re afraid to let our children play outside. We medicate ourselves at much higher rates. We hold jobs for longer periods of time. We move across state lines at much lower rates than before. Even our productivity growth is down. This is a kind of national malaise affecting this country. Knowledge@Wharton: [This dynamism] was a core characteristic of our country as it developed back in the 1700s? Cowen: That’s correct. Even up through the 1980s and 1990s, this country was much more dynamic than it is today. There’s this myth that we’re so wonderfully innovative with tech. We have done some very nice things, but a lot of those improve your leisure time. They make it easier for you to goof off at work, easier just to stay at home and have things sent to you, or entertain yourself with the internet. So, it’s not actually making our economy that much more productive. Knowledge@Wharton: Is the tech revolution the driving force behind this shift, or are there other factors at play? Cowen: Some of it is tech, but I think some of it is just history. In this country, the 1960s and 1970s were so chaotic. People felt alienated. People decided “never again” for this. We improved this country a lot, but we also went too far in slowing down change, making it harder to build infrastructure, put in new apartment buildings. This is the era of NIMBY: not in my backyard. Knowledge@Wharton: Can this be corrected, or are we at a point where we are going to be dealing with this for years to come? Cowen: [I think] for many years to come. I think it will be corrected in the sense that eventually we will fail and it will fall apart. That’s a kind of correction. But I don’t think we can just wake up and decide to go back to the dynamism of the America of 50 years ago. We’re too locked in. Knowledge@Wharton: What do you think the American Dream is today? Cowen: The American Dream is strongest for immigrants. They are our least complacent class. They’re the most dynamic. In some ways, they’re neurotic. Striving and unhappy and building and grasping. I think that’s wonderful. I think parts of Silicon Valley are not so complacent. But overall, the American Dream has been a life with not so much change, where you get to keep what you feel is yours. I feel we can do better than that. Knowledge@Wharton: If we have an increasing level of entrepreneurship in this country, does that eat away at that complacency? Cowen: Well, if we only did. Keep in mind that startups, as a percentage of total businesses, have been declining every decade since the 1980s. Also, keep in mind that immigrants start new businesses at a rate twice as high as native-born Americans. So, we’re ailing a bit on that one. I wouldn’t say all of our creativity is gone, but the picture is not as rosy as many people think. Knowledge@Wharton: What do we need to turn the page and start to see that dynamism again? Cowen: There are plenty of laws and regulations I would change. In many parts of the economy, I’d have less regulation and make it easier for people to, say, put up a new apartment block in San Francisco or parts of New York City. But I think the fundamental issue is a psychological one. That is, why are we not so interested in those kinds of changes? In part, we believe we can continue as we had been, more or less forever. What I’m trying to do with my book is give people a greater sense of urgency. Knowledge@Wharton: So, people feel like if they are comfortable right now, then they have exactly what they want? Cowen: That’s right. But we’re eating into the seed capital for future generations. If we just stop being creative, at some point we can’t pay all the bills anymore. Knowledge@Wharton: Technology has actually made this problem worse? Cowen: Sure. So, people do Netflix streaming at home. They just sit there. Amazon delivers packages. Uber will deliver your food. These are great conveniences. I don’t think the point is to criticize them. The point is, when so many of your innovations are directed only toward convenience and not enough toward production and dynamism and reshaping your physical environment and building the next grand vision, your society will become a bit sleepy and complacent. Knowledge@Wharton: If we were able to rebuild the manufacturing sector here in the United States, would that help the mindset? Cowen: I would stress that the manufacturing sector, in terms of output, pretty much has been rising every year except for the recession, contrary to what you hear. What’s gone down are manufacturing jobs, and that’s because of automation. I don’t think there’s any way to bring those jobs back. But the sector itself is doing fine. In a sense, that makes it harder. Knowledge@Wharton: People have busier lives than we’ve had at any point in the last 20, 30 years, especially people with kids. Maybe they don’t want to take the time to do the searching, or they feel more reliant on some of the newer tools that we have. Cowen: I draw a distinction in the book between physical space and information space. We’re much, much busier in information space — managing our e-mail, being on Facebook, dealing with what our smartphone sends our way. Again, that can be useful, but we’re so over-specializing in this one part of life and so stagnant in terms of the other parts, like building a better and brighter nation, improving our infrastructure, having some grand project for the future. I think there’s a very dangerous imbalance. Knowledge@Wharton: How does this problem relate to the different economic classes, the haves and have-nots? Cowen: You see complacency at all levels, though it takes very different forms. The haves tend to think everything’s fine. They have a lot of criticisms about social justice, but they don’t see it as so urgent the way Americans did in the 1960s. The have-nots are typically not so content, of course. But they tend to live with their parents for many more years than used to be the case. They’re less interested in buying cars or owning homes. They move much less for jobs. They’re more likely to take opiates or smoke marijuana. They’re more likely to seek being on disability even if they’re not fully disabled. I think they, too, are somewhat of a complacent class. Knowledge@Wharton: You brought up NIMBY. You have several other ones to go along with it, including NIMEY — not in my election year. That plays into the problem of complacency within our government. Cowen: Midterm elections are less than two years away. People in Washington, D.C., are already gaming it. It makes it harder to change things. Politics is more polarized and people now have the sense that no voter should ever have to take much of a loss on anything at all. Knowledge@Wharton: There’s been a surge in political protesting. How does that impact what you’re talking about? Cowen: I think that’s healthy. I don’t agree with everything the protesters are calling for, but I’m happy to see it. There’s been too long a time in this country where we have not had a healthy tradition of protest. We’ve bureaucratized our rebellion, so to speak. It’s much harder to get the permits and to be in the spaces you want to be in. I’m hopeful this is a slight re-emergence of political dynamism. For all the polarization, there’s actually an odd agreement that not too many things in America should be allowed to change. Trump himself campaigned on cementing in all entitlements. Whether or not one agrees with that, it’s remarkable. That’s almost 80% of the budget, and the two parties agree on that almost entirely. Knowledge@Wharton: Getting back to technology, I’m guessing that’s part of the reason why we [like so many of the same things] rather than seeking out unique things and finding our own paths. Cowen: That’s right. It’s very easy to ignore the world when the internet is fun and, at the margin, it’s cheap. You can protest politically on your Facebook page or write a tweet and just put it aside, get to the next thing. I think that’s the world we have right now, and I don’t think it’s done very well by our politics. Our governance, in my view, is increasingly dysfunctional. Knowledge@Wharton: A lot of people would say that social media has taken away our in-person connectivity with each other. Cowen: Where we live is a bigger problem. These days, Democrats are much more likely to live next to other Democrats, and the same is true for Republicans. The notion of people not really knowing people who voted for the other candidate is much more prevalent now than it was in the 1980s or 1990s. Knowledge@Wharton: Do you expect that to continue and grow? You talk about this new level of segregation that’s happening in the U.S.
Cowen: There’s a lot of evidence that it’s worsening as we speak. It’s mostly based on income. Can you afford to buy into the nice neighborhood? I don’t think it’s overt racism, for the most part. There’s some of that, but income maps into race, it maps into education, and it’s making us a more divided nation. There’s a big divide. I wouldn’t put it in terms of the 1% versus the 99%. I think it’s highly educated people with good jobs, who are at least 15% or 20% [of the population], versus others. You know, the top 5% and the top 1%, their perspectives are not really that different. Knowledge@Wharton: You have a chapter in the book titled, “Why Americans Stopped Creating.” When you look at it from a historical perspective, what happened? Cowen: America of the 20th century was built on the idea of powerful machines and factories and fossil fuels and manufacturing. We created every possible innovation based on the combination of those ideas with electricity. You get the radio, the car, the plane. We do phenomenally well with those. But we’ve somewhat exhausted those technologies. Each decade they get a little better, but cars are still basically cars. If you took the Tyler Cowen of 1979, when I learned to drive, and put him in a car today, I could work the whole thing without even having to think about it. That’s a little discouraging. It’s not what our ancestors would have expected or what you read about in science fiction. I think slowly but surely we’ll create a new technological paradigm in this country — how to do things that are not just machines and fossil fuels, how to make health care and education extremely productive again. But we’re certainly not there now. Knowledge@Wharton: Do you think right now we want to find other people who match with us so we don’t have to struggle? Cowen: That’s right. You get one law partner marrying another, and odds are they’re quite happy. But in terms of overall social mobility, maybe that’s not ideal. People can match to the music they want to hear so much more easily than before. Satellite radio is one way; I do it myself. But in terms of new musical creativity, I don’t feel we’re living in a wonderful time. It’s a great time for the listener, not a good time for the creator. Knowledge@Wharton: Going back to the recent election cycle and protesting, what happened that took away the ’60s mentality? We had a gap of 35 years or 40 years where you just didn’t have protests as a staple of American society. Cowen: I think around 1980, we decided that world was too chaotic, too volatile, and we were going to end [the chaos]. We were going to do everything possible to lower crime, no matter how many people we had to lock up or how much broken-windows policing that would mean. Again, those were mostly positive developments. But once you’re on a track to make everything safer, it’s very hard to stop or to restrain yourself along the appropriate margins. We’ve just gone way too far. Now we’re locked into this mentality, and it’s hard for us even to see how much we’re committed to a kind of complacent embrace of the status quo, backed up by a lot of complaining. We observe our own complaining, think we’re not complacent, but we’re fooling ourselves. Knowledge@Wharton: You talk about the impact of these problems on the political structure. What is the future of our political structure because of this complacency? Cowen: The American political system works best when there’s a growing pie and you can hand out something to everyone. It’s not always pretty, but it does work. When you have a fixed pie and you’re fighting over the same pieces of that pie, things become more divisive. Ultimately, the quality of governance declines, in terms of execution and competence and the public feeling that government is accountable to it. We’re seeing all that already. So, the crisis may be coming even more quickly than I had expected. The next 10 years will be a very bumpy time, most of all politically. Is there a national consensus over what we should do with our budget and our resources? I don’t see it. And each side thinks the other side is not really legitimate. Knowledge@Wharton: If we can’t even agree on basic things on Capitol Hill, then it’s next to impossible to be able to push forward a lot of these new ideas, correct? Cowen: That’s exactly what we’re seeing. You see it with health care reform. The Republicans voted over 60 times to get rid of Obamacare. Whether or not you agree with that, they did. Now they’re in power, and they’re not going to get rid of Obamacare. They want to tweak it at the fringes. Again, whether you agree or disagree, it’s a sign of how stuck we are, that we can’t imagine ways of doing things in a fundamentally different way. Benefits get locked in, and we have a big status quo bias.